Click here to find out more about the Teach 4 the Heart podcast. When I first started teaching I had no idea how to counsel a student or what to say to a student who was misbehaving. And, yes, I mean none. I knew just saying “stop doing that” wasn’t really going to cut it. But I remember wondering what on earth I was supposed to actually say. How was I supposed to go about having a meaningful conversation that would make a real difference and produce lasting change? Thankfully I taught at a great school where genuine student discipleship was consistently practiced. By seeking advice from fellow teachers and observing my administrators counsel and disciple students, I gradually started get the idea. Tell them what they need to hear (not what they want to hear). I’ve realized that the essence of wise counseling is telling students the truth that they need to hear, even if they don’t like it. As a Christian, I believe God’s Word is the source of all truth, so when I’m trying to think of what advice to give, I always go there first. If you teach in a Christian school, you should absolutely share Scriptural truths with your students. If you teach elsewhere, you may not be able to share Scripture, but you can absolutely still share truth. And please don’t think you’re sparing the student’s feelings by leaving out the hard truth or telling them what they want to hear. You’re actually doing them a huge disservice. Speak the truth in love. If we truly care, we will tell them the truth. But at the same time, we must speak with love and kindness for our words to have any impact. The student needs to be focused on the truth being spoken and not distracted by a teacher’s demeaning attitude. Yelling at the student will likely cause him to disregard your message and will just result a hilarious story for him to tell his friends. Instead, speak calmly and kindly so that the student must honestly evaluate his own actions and not yours. Seek wisdom and advice. When you don’t know what to do, ask for help. As a Christian, my biggest source of help and guidance is God Himself, who promises to give wisdom if we just ask for it (James 1:5). Fellow teachers or administrators can also be a great source of wisdom and advice. So ask them what they would say in a certain situation. Better yet, ask if you can sit in on a conversation they have with a student so that you can see wise counseling modeled in front of you. What other tips do you have for teachers who desire to give wise counsel to their students? Share them with a comment below. Grab our newest book Take Heart & Teach and discover make a connect with your students in a more meaningful way. 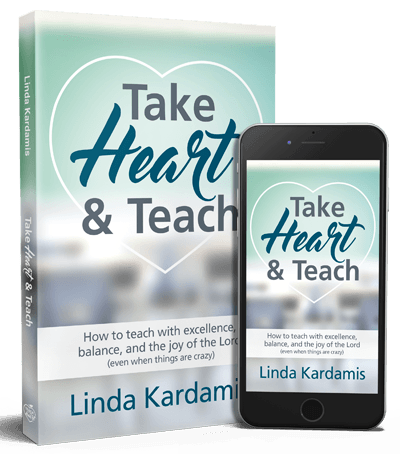 You'll also learn how to teach with excellence, balance, and the joy of the Lord, even when things are crazy. Find out more about ​Take Heart & Teach. Thank you very much Linda. Reading this makes me think of the Golden Rule in Luke and Matthew: “Treat others the way you want to be treated” I think this definitely applies to our relationship with our students; as Christians, what we model will matter more than just what we say! You gave great practical tips for counseling students. Thanks for this post!